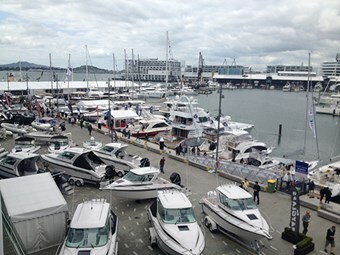 The Viaduct Harbour will play host to more than 200 boats and nearly exhibitors, at the Auckland On Water Boat Show from the 25-28 September 2014. The Auckland On Water Boat Show will run from 25-28 September. The Auckland On Water Boat Show (formerly the Auckland International Boat Show) has been steadily growing over 16 years and this edition has added new dimensions to the show, popular with industry and recreational boaters. In the 25 years since Sir Peter Blake raced Steinlager 2 to become the first (and only) yacht to win all six legs of the Whitbread Round the World race, 'Big Red' has become part of the fabric of our maritime history. The illustrious yacht will be at the show for viewers to explore this special part of our on-water history for themselves. The show’s famous for its ability to draw exciting new vessels to the Viaduct Harbour. This year, boat builder Riviera alone will have $10,500,000 worth of yachts on the water, while Kiwi company Pachoud Yachts will display its latest luxury sport cruiser. Bavaria will have their Bavaria 41 and 46 models on display. Black Dog Cat’s aluminium trailer boats will be whipping show visitors around the harbour for trials, demonstrating their hardiness and easy manoeuvrability. Sealegs will also have its amphibious craft on site for visitors to take a spin in. With 100 boats in the marina, there’s plenty to jump onboard and explore. Tristram Boats will also have its brand new ‘701’ models on display, and will reveal an exciting collaboration project from a trio of well-known names. If you fancy yourself nimble and able to quickly pick up new skills, you might like to head to Aloft Alone, outside Pavilion three and try your hand at climbing the 6m mast. If something less energetic is your cup of tea, make your way up to level three of the Viaduct Events Centre where marine experts will give a series of seminars on Saturday and Sunday. Meanwhile, West Auckland company Lancer Industries has built a 20m, stand up paddleboard. To raise money for the Child Cancer Foundation, it'll be attempting to have the most people ever on a SUP. A single day pass to the Auckland on Water Boat Show costs $18 (children under 15 get free entry), or you can get a four-day adult pass for $27. Your mates at Trade-a-Boat have got 25 tickets to give away – click here for your chance to win. For the latest news and reviews, subscribe to Trade A Boat magazine here.